"This is my mom's biscuit recipe, passed down from her mom and grandma who lived their entire lives on the Mississippi Delta. Of course it took a lot of trial and error to get it right because she was from the 'handful of this and a pinch of that' school of cooking. You can use milk or plain yogurt in place of the buttermilk. Shortening or butter can stand in for the lard. Serve with butter, jelly, honey, gravy, or whatever your favorite biscuit topping is." Preheat oven to 450 degrees F (230 degrees C). Prepare a 9-inch cake pan with cooking spray. Mix flour, baking powder, salt, and baking soda together in a mixing bowl. Mash small chunks of lard into the flour mixture with a pastry cutter or with your fingers, letting each addition integrate fully before adding the next, until all the lard has been added and the mixture resembles coarse-ground cornmeal. Make a well in the center of the flour mixture. Pour milk into the well. Stir the mixture with a spoon, making sure to scrape the edges of the bowl so that the dry flour there gets wet, just until the milk is incorporated into the dry mix and there are no large areas of powdery flour remaining, leaving lumpy dough which is sticky in some places and even a bit grainy in the driest areas. From here, use your hands to carefully mix to ensure even consistency. Divide dough into 8 equal chunks and shape each into a thick biscuit. Put the shaped biscuits into the prepared cake pan with the sides touching. Bake in preheated oven until the tops are light golden brown, about 15 minutes. 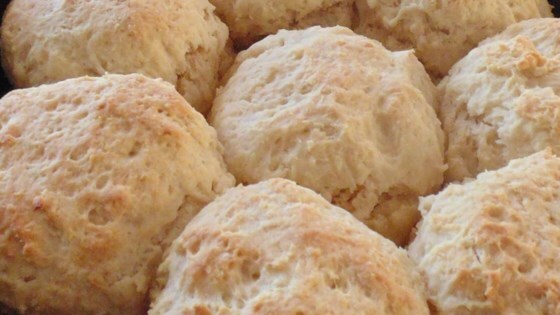 See the trick to making huge fluffy biscuits. You can make smaller biscuits, just adjust the baking time, or they'll turn out overcooked. FAMILY DIDN'T LIKE THEM AT ALL. WILL NOT MAKE AGAIN. I make these often. They always disappear quickly. Like some others I increased the salt a bit and used a combination of milk and yogurt instead of butter milk. I used butter as the lard because that was what I had. I had to add a little more flour so I could divide into biscuits because it was very sticky, but they turned out perfect and tasted great!